Roof Repair or Replacement: Which One Makes More Sense? Home » Roof Repair or Replacement: Which One Makes More Sense? The roof is one of the most critical parts of your home and in the event where it has a problem that needs to be addressed, you need to decide carefully if you should repair or replace it. The choice between the two isn’t always clear but there are ways you can tell which is the more appropriate course of action. Signature Exteriors, your local roofing experts, discusses how to choose between roof repair or replacement. A simple way to tell if you should do roof repair or replacement is by checking the age of the roof or its operating lifespan. At some point, any repair work you’ll do on a roof will cost as much as a replacement. For asphalt roofs, this is its 20th year. Once the roof reaches this threshold, it’s more practical to replace it completely. The extent of the damage will also help you choose which method is more appropriate. If what you’re addressing is a specific part of the roofing system, then repair is the way to go. A good example is when the shingles develop leaks. You simply need to patch them up to address the issue. Replacement is the more appropriate course of action if what you’re addressing is a long-term problem such as when the roof sustains severe storm damage. While repairs can help, it’s better to replace the roof shingles if the damage it has sustained is considerable and is starting to affect the performance of the system. An easy way to tell if your home will require a complete roof replacement is if you notice a large number of granules in the gutters. These are shed over time as the roof ages, but the shingles will lose these at a faster rate once it reaches its age threshold. Shingles that are completely stripped of their protective granules can no longer protect the house from sun and rain damage, so replace them before they become a real problem. 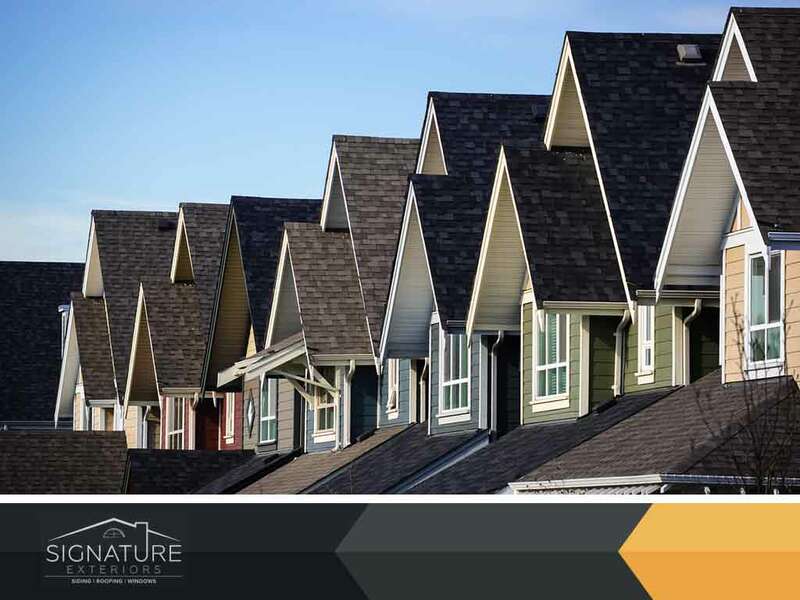 As your local roofing experts, Signature Exteriors will help you decide which course of action makes more sense during your upcoming roofing project. We offer high-quality roof repair and replacement services. Call us today at (866) 244-8029 to learn more about our services. We offer complete roofing services throughout Westchester, Norwalk and other parts of Connecticut.